This is NOT Edmund, but it might’ve been his teacher! 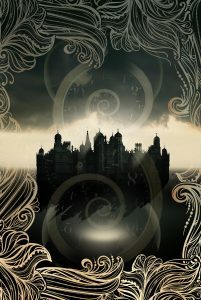 First off, writing time travel fiction involves research. Lots of research. Books. Internet. Museums. Rinse and repeat. All those activities informed my writing of Edmund and his world in A Thief in Time. But in another way, writing Edmund was a job I began preparing for when I was just seven. That was the year I saw my first two Elizabethan-era dramas onstage. I don’t remember which I saw first—Rosencrantz and Guildenstern are Dead or The Merchant of Venice—but I was at that golden age of language acquisition, and I soaked up the thees and thous and cansts and wherefores just like they were any other new-to-me words uttered by adults addressing other adults. I was smitten by the rhythm and sound of all those delicious words, chewing them like Halloween candy long after the weekend of play-going was over. Not long after hearing those plays, I noticed that my grandfather used this same toothsome language when he read to us from his King James Version of the Bible. Elizabethan and Jacobean English quickly became as comprehensible to me as any other form of English. For a kid addicted to the texture and flavor of words, this stuff was Nirvana. While I was still young enough that my parents made me go to bed before Anne Boleyn’s head was struck off (The Six Wives of Henry VIII), I continued to receive regular doses of the English spoken in the 16th century, returning to Ashland, Oregon’s bard fest for even more Shakespeare during my 11th, 12th, and 13th summers. Well, at that point the deal was sealed for me. Shakespeare nerd for life. Fast-forward to my more recent writerly life. 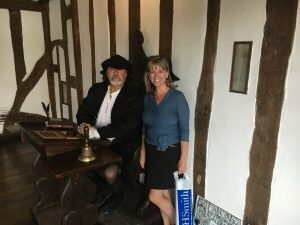 Dr. Science and I returned to Stratford-upon-Avon twice in the past four years, spending as much time as possible visiting sites associated with Shakespeare. His house. His wife’s house. His school. His church. The hall where his dad was a magistrate. His mother’s family’s farmstead. All these buildings are still standing today. 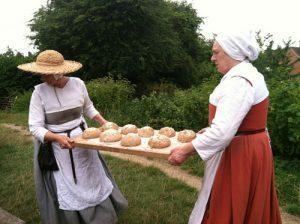 And some of them are in operation or are run as “living history” museums, where you can see how bread was made in the Elizabethan era or practice penmanship seated at desks that have survived five centuries of students. When it came to the actual writing, obviously I held back on period-correct language, but probably the most fun part of writing Thief was figuring out the places where I could sneak in some “language.” Hopefully it wasn’t too distracting for those who don’t relish chewy language! So there you have it, my report on “How I Wrote the Character Edmund.” Really, it was child’s play. Are there any remnants of childhood geekery in your job or pastimes? I’d love to hear in the comments! P.S. In case you wondered, “Shaftesbury” is a nod to the tiny lane in London’s theatre district. Because I’m the author and I can.